Designersblock is one of our favorite events because it's a great place to find plenty of quirky, innovative and bizarre new eco-friendly designs. The show is famous for setting up shop in neglected spaces as part of the London Design Festival, and this year the showroom was located in a storage facility at the South Bank. From wacky handmade machines to fantastic 3D-printed objects, click through to see our exclusive photos from the event. BreadedEscalope studio presented their low-tech, low-energy, steam-bending machine and showed the public how it worked at this year’s bustling Designersblock event. 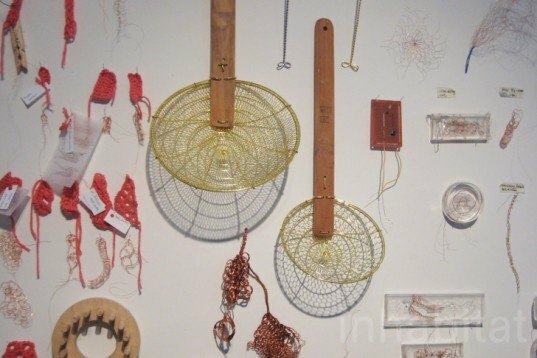 As 50% of the world’s computer waste ends up in four small villages in China, Kuan Ting Liao decided to draw attention to the issue by knitting all sorts of objects from found materials. 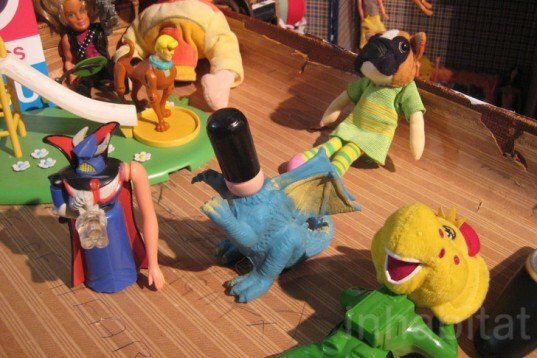 One of the weirdest and most wonderful surprises we come across at this year’s event was a non-profit arts organization called Exploring Senses that recycles old toys into bizarre new creations. 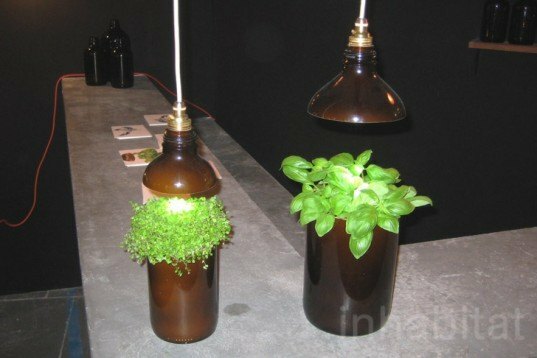 DeGross studio were showing their sleek unique lamps (and plant pots) made from reused glass bottles found behind their London studio. 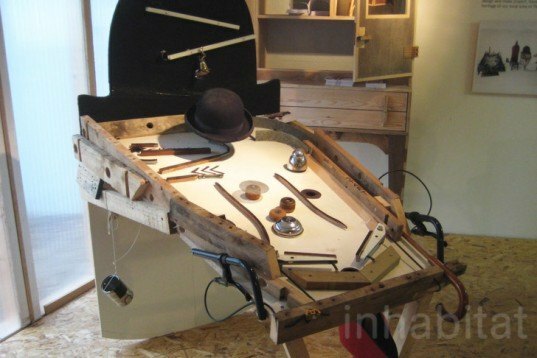 Long-term collaborators with this great event, Hendzel+Hunt from MADE IN PECKHAM, set themselves a 24-hour Design Challenge to make furniture and even a pinball from all sorts of recycled found objects. Designer Roey Hunt used to work as a tree surgeon until he decided to make these beautiful seats from sick 100-year-old trees that were going to waste. Adrian Draigo‘s eye-catching lamps GLO use a flexible string of 240 LED lights shining through repurposed, multicolored plastic bottle tops. Walter Raes is a very skillful Belgian artist who creates wearable art from repurposed shoes, supermarket bags and other mass-produced items. 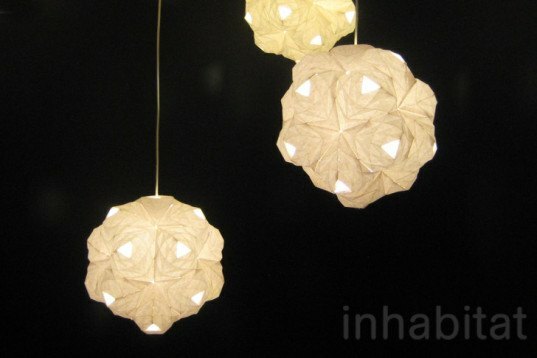 British studio Lazerian was also present this year featuring their latest celestial lamps, which are made entirely out of folded paper. 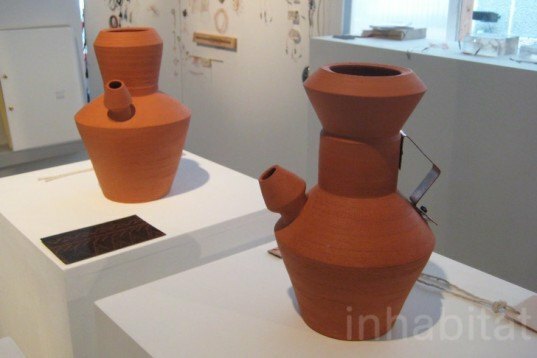 Tunisia Made by Hend Krichen is a series of hand-made terracotta and copper vases that aims to stimulate the industry and celebrate traditional crafts that might disappear in little time. Just before we left, we caught up with one of Designersblock’s founders, Rory Dodd (seen here in a blue T-shirt), who was very excited about this year’s central location that welcomes the design scene but also surprises London’s tourists and citizens. 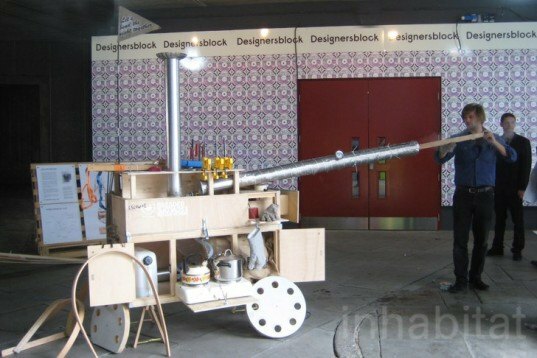 BreadedEscalope studio presented their low-tech, low-energy steam-bending machine and showed the public how it worked at this year's bustling Designersblock. As 50% of the world's computer waste ends up in four small villages in China, Kuan Ting Liao decided to raise the problematic issue by knitting all sorts of objects from found materials. One of the most weird and wonderful surprises we come across at this year's event was a non-profit arts organization that recycle old toys into bizarre new creations called Exploring Senses. Long-term collaborators with this great event, Hendzel+Hunt from MADE IN PECKHAM set themselves a 24 hr. Design Challenge making furniture and even a pinball from all sorts of recycled found objects. 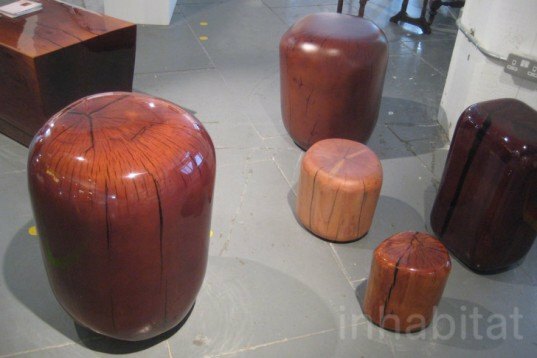 Designer Roey Hunt used to work as a tree surgeon until he decided to make these beautiful seats from 100 years old ill trees that were going to waste. 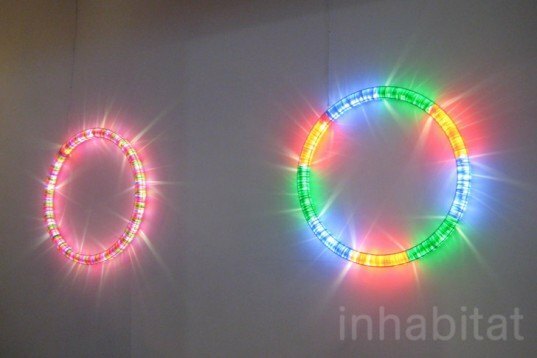 Adrian Draigo's eye-catching lamps GLO use a flexible tubular light of 240 LED's shining through repurposed multicolored plastic bottle tops. 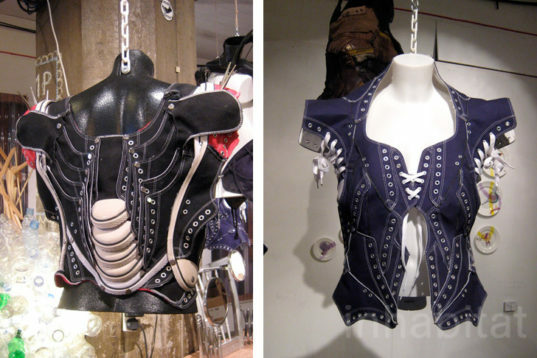 Walter Raes is a very skillful Belgian artist creating wearable art from repurposing trainers, supermarket bags and other mass-produced items. Matthew Plummer-Fernandez's cero-waste 3D printed bowl. Tunisia Made by Hend Krichen is a series of hand-made terracotta and copper vases that aims to stimulate the industry and celebrates traditional crafts that might disappear in little time. 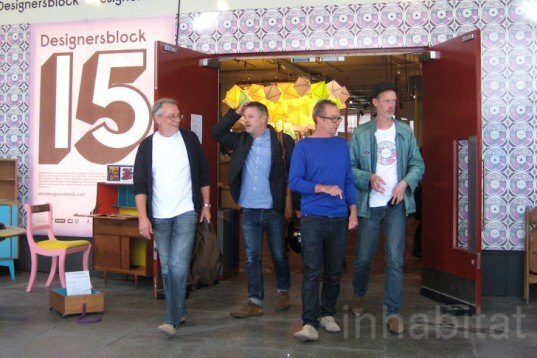 Just before we left, we cached up with one of Designersblock's founders, Rory Dodd -- here in a blue T-shirt --, who was very excited about this year's central location that welcomes the design scene but also surprises London's tourists and citizens.